How to make the chart_11, chart_12, ..., chart_23 variables dynamically? Is there a way to automatically calculate natural bin sizes (e.g. c11_bin, c12_bin, ..., c23_bin? Better ways of setting .x() and .xUnits for each dc.js chart object -- the code is not very DRY. Any other improvements / suggestions for making this code easier to scale and maintain. Here's the Computer Science 101 answer: put the parameters that change between charts into an array, and then loop over that array. I want to include your code and data as a dc.js example (if you will permit it?) so I started porting it to the standard format used by those examples. You also had unique selectors for the chart titles, but those were redundant, so I removed them. Let's walk through the rest of the code. 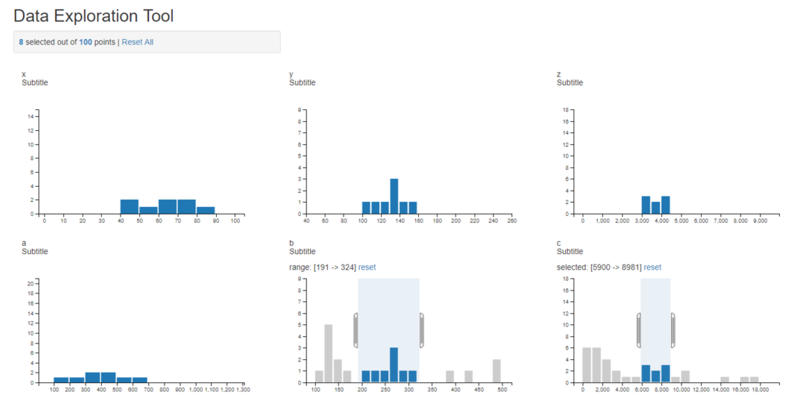 This is the first of many places where you'll see chart_specs.forEach(). That's the essence of the "CS 101" answer! We'll get an array of charts back. For simplicity I changed the divs to h5s and gave them the class chart-title. Now we can change the titles with a simple generic D3 call. Otherwise it's the same idea as your old jQuery calls. See the original answer for the purpose of this code. The only interesting here is using charts[i]. Array.forEach supplies us not just the current item but the index, which we can use to access the chart in the charts array. Same idea with all of the rest of the code. We just look at spec.variable and spec.resolution instead of having special variables for every chart and every value.